This divinely rich and sweet dessert will add sparkle to your New Year celebrations. Line a 2-litre pudding basin or freezerproof bowl with clingfilm, pushing it into the base of the bowl and leaving some hanging over the edges. Line the base and sides with 1 pack of fingerellas. Drizzle 4 tablespoons of the Frangelico evenly over the sponge. Spoon the gelato into the bowl, pressing down with the back of the spoon. Top with the remaining fingerellas and Frangelico. Wrap the overhanging clingfilm over the top and push down to level the surface. Freeze for 3 hours, or until needed. When ready to serve, preheat the oven to 250°C, gas mark 9. Place the egg whites into a clean bowl and whisk with an electric mixer for about 2 minutes until firm. Gradually add the sugar and continue whisking until the mixture is thick, smooth and glossy. Fold in the sifted cocoa with a metal spoon. Remove the gelato and sponge from the freezer. Use a palette knife to turn out of the bowl and on to an ovenproof serving plate, flat side down. Remove the clingfilm and discard. Spoon the meringue on to the gelato and sponge and, using the palette knife, smooth it evenly over the top, making sure there are no gaps. Bake for 3-5 minutes until the meringue is just firm and beginning to colour. 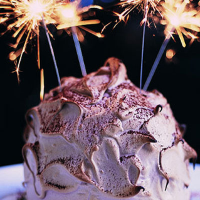 Serve, dusted with cocoa powder and decorated with indoor sparklers, if you prefer.